The ‘Land of the Thunder Dragon’ – a small country sandwiched between Tibet in the north and India in the three sides offers a mesmerizing and unspoiled cultural and natural grandeur. Bhutanese landscape is characterized by rugged terrain and steep mountain valleys from subtropical plains in the south, through the temperate zone to the Sub-alpine Himalayas exceeding 7000 meters. Bhutan is predominantly a Buddhist country with Vajrayana Buddhism being Bhutan`s state religion. Hinduism is Bhutan`s second-largest religion mostly followed by the Nepali speaking Bhutanese in the south. 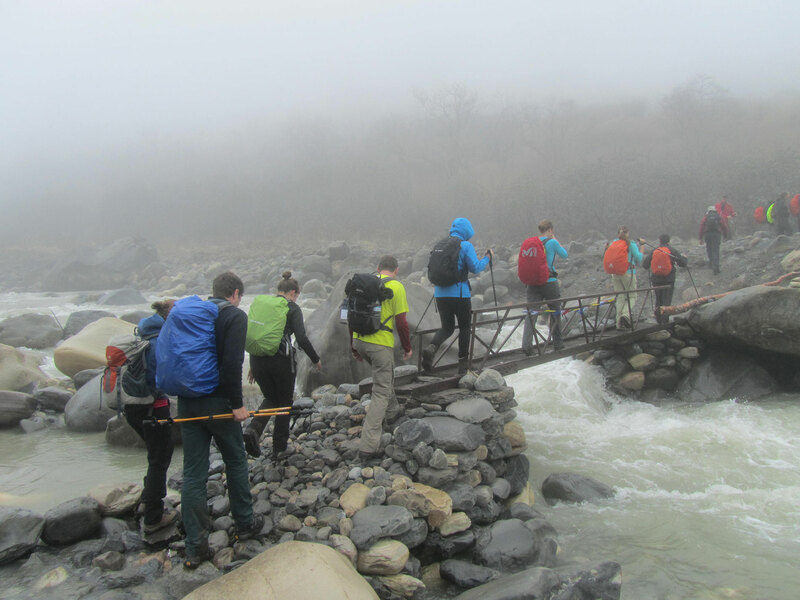 The 11-days Druk Path Trek offers cultural highlights of Bhutan combined with stunning 6-days trek and 3 days cultural tour. Discover Bhutan with one of the finest short treks in Bhutan, the Druk Path, leading from Paro to Thimphu and following the traditional high route between these towns. After an exploration of the Paro Valley, our first day’s walk takes us up to the ruined Jele Dzong which sits on a high ridge and commands breath-taking views across to Jumolhari. During the next 4 days of super breaking, we climb above the tree-line and cross several passes, including the Phume La (4210m.). We make camp beside clear mountain lakes, visit a number of yak herder`s encampments and have splendid views of the peaks on the Bhutan/Tibet border, including Jitchu Drake and Gangkar Puensum. Arriving at Thimphu, we have a full program of sightseeing, at the impressive Tashichhodzong, the traditional summer capital of Bhutan. An excursion to the important Dzongs at Punakha completes this unbeatable 11-Day experience of Bhutan. After breakfast hike to Taktsang (Tiger’s Nest) Monastery, which is Bhutan’s most famous monastery situated at 3180 meters. Guru Rinpoche (spiritual master) is said to have flown on the back of a tigress to meditate in a cave where Taktsang Monastery now stands. Lunch will be served in the Cafeteria Restaurant, located about halfway up on the mountain. The monastery is perched on the edge of a steep cliff, about 900 meters above Paro Valley. After having explored the monastery, you will hike down to Paro. After breakfast in your hotel, you will drive to the roadhead at the National Museum from where you will start the trek. The trek trail is rather gradual up till the camp and if the weather is clear the Paro valley can be seen with snow-capped mountains behind including Jumolhari in the distance. Above the camp is Jele La Dzong (3,400m) and Jele Dzong is mostly in ruins and there is a Lhakhang with the statute of Buddha Sakyamuni. Before your trek, you can explore the Jele Dzong which sits at 3570m. Today’s trek begins with an hour and half climb and then ascend gradually up. The trail takes you through thick alpine forests and rhododendrons crossing the Jele La (3490m). You may see yak herders around your campsite. There are fascinating views of Jumolhari and other snow capped mountains and you can also hear some Monal peasants during the day. The trail climbs steeply to the Jangchulakha (4180m). On a clear day the views of the mountains and valleys are sensational. Descending from the pass you arrive at your camp beside the Jimilangtsho lakes. These lakes are famous for their giant sized trouts. Also there are great views of 6,989m Jichu Drake, the peak representing the protective deity of Paro and Gangkar Puensum (7497m), Bhutan’s highest mountain. The trails climbs up from lower end of the lake and makes a traverse along the side of the ridge, then descends to a single stone shelter. Again ascend to a summit at 4050m overlooking Janetsho Lake. Today you may come across some yak herder’s camp and get an idea how these people live. Camp is close to Simkota Lake. Today you begin with gradual climb and if the weather permits, you will enjoy majestic view of Mount Gangkar Puensum, and also the other peaks. The trail slowly descends through junipers trees to a community hall near Phajoding. From Phajoding the trek to Thimphu is downhill all the way, passing through a forested area of mostly blue pine. On arrival, check into hotel in Thimphu. After breakfast you will visit the King’s Memorial Chorten (built in memory of the third King of Bhutan who reigned from 1952-1972), Nunnery temple, the National Library (which houses ancient manuscripts), and the School of Arts and Crafts (also known as the painting school). You will also visit the National Institute of Traditional Medicine, the traditional paper factory and the majestic Tashichhodzong. After lunch, enjoy the scenic drive to Punakha with a stop for tea at Dochu La (3,100 meters), where on a clear day you can get spectacular views of the Himalayas. From the pass, drive downhill through the forests of rhododendron, fir and hemlock. You will arrive at Punakha after traversing through rice field and along the bank of Punakha River. After breakfast, you will visit the Punakha Dzong, which is stunningly situated in between the male and female rivers like an anchored ship. Then drive to Paro. On the way, you will stop at Metshina Village and take a 20-minute walk through the rice fields to Chimi Lhakhang, which is a fertility temple dedicated to Divine Madman or Lama Drukpa Kuenley. If you wish, receive the blessing from the Lama’s wooden phallus! Continue drive to Paro via Dochu La Pass. Here, you will visit the new Druk Wangyal Monastery, which is the only of its kind in the country with elaborate paintings depicting the lineage of the present monarchy and their visionary works. Stop in Thimphu for lunch. Later in the evening, you can drive to Paro.